Asiatique The Riverfront has everything you need for a crazy fun shopping day. Even though you are not a shopping lovers, there are so much to see in this place. Why Asiatique The Riverfront is special ? Asiatique has successfully combined two of the most popular shopping experiences in the city: a night bazaar and a mall. Ten minutes downriver from Saphan Taksin BTS station this once-bustling international trade port has been transformed, with over 1,500 boutiques and 40 restaurants housed under a huge replica warehouse complex. Opening from 17:00, spending an evening here is no problem: you’ll have good fun browsing the boutiques, picking up gifts or something for yourself; you are guaranteed to find something you would like to eat and if this isn’t enough entertainment, shows are performed nightly: Calypso ladyboy cabaret and soon, a classic Thai puppets performance. Wide streets run between each warehouse and Asiatique provides retro props for photo opportunities: a reproduction tram car, anchors and a push cart. The decor does feel a little overdone on occasion and not quite in keeping with the designers’ plans to evoke nostalgia for the 1900s but it’s so well planned, clean and spacious that the lack of history doesn’t really matter. 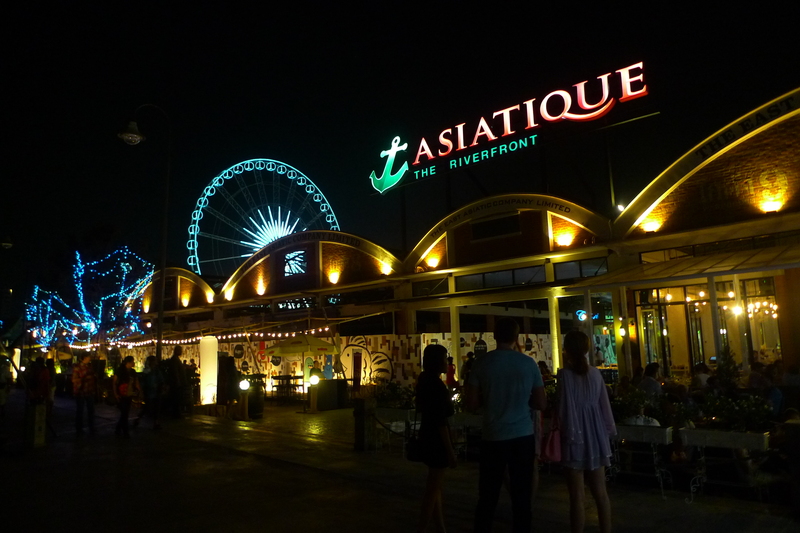 What to explore at Asiatique The Riverfront? Once you enter the hangars, you appreciate the design even more; this is probably the only market in Bangkok where you can find a stall by looking at a map. Asiatique is split into four categories to help you find what you are looking for without too much hassle. How to get to Asiatique The Riverfront? The easiest and fastest way to get there is via boat. Take the BTS to Saphan Taksin and jump on the free shuttle at the end of the pier. It only takes ten minutes, and the boat runs until 23:00. Taxis are not recommended as the traffic can be terrible in this area. From the boat you step off onto a long boardwalk which runs for 300 metres that looks romantic once the sun has set. Products seem to be much expensive than they are sold in other markets. But it still worth a visit. You should go there early to avoid the long queue while waiting for the boat. Don't come here too late at night as some store closed at 10. Bars and pub still open though. The ferry cost 300 baht per adult. There is also some historical building still here including the old sawmill and a World War 2 bomb shelter along with numerous bronze life size statues of life on the docks. Take the BTS to Saphan Taksin. Then walk straight to the river and hop on the free fairy boat to get there. Quite a cool place, but totally geared to tourists. Pint of Guinness = almost 300 THB (£6 GBP / $9 USD). Even the local Chang beer was 180 THB (£3.80 GBP / $5.50 USD). A different kind of market with organized small stalls and boutiques. Plenty of restaurants and bars to choose from also with live music. The goods are not more expensive than in other markets but its all a it cleaner and nicer.